D. Dorjnamjaa, l.S. Kondratov, D.M. Voinkov and Ts. Amarsaikhan (2007). Specific gas composition of the adsorbed form in impactites of the diamond-bearing Mongolian astropipes. Goldschmidt Conference Abstracts 2007, Geochimica et Cosmochimica Acta, 71 (15): Suppl. S, Aug.2007, A231. The new methodics. At present scrutiny of the adsorbed form of gas in rocks of diamondiferous provinces is new acknowledgement of an elaboration and sampling of the intraditional prospecting methodics. The new results. According to Dorjnamjaa et al. (1) the Agit Khangay, Khuree Mandal Tsenkher, and Bayan Khuree diamondbearing ring impact astropipe structures are established for the first time in Mongolia. These astropipes are wonderfullypreserved from erosion and active denudation, and characterized by both well natural exposures and diversity of different impact-derived and shocked magmatic rocks and minerals. The Agit Khangay astropipe is the most detailed studying meteorite structure. 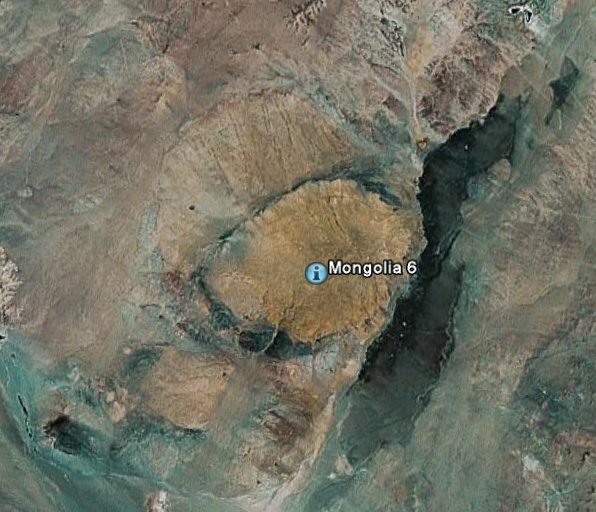 The Agit Khangay astropipe in western Mongolia was formed at the Permian granite massive. The crater's total diameter is about 10 km and filled with shattered and shocked granite (agizit). Most panned samples and hand specimens contain microdiamond of octahedron habit, gold, platinum, moissanite, pyrope, rhenium, coesite, khamarabaevite (TiC), graphite-2H, etc. Conclusions. The adsorbed form of gas in the Mongolian astropipe impactites (Agit Khangay-sample 32/99, Khuree Mandalsample 58/03, Bayan Khuree-sample 17/03) has been compared with gases of analogous form in volcanic rocks of modern (Volcano Gorelii, Kamchatka) and ancient (Maikhantsample 25/04 and Zuun Busluur-sample 36/04., volcanoes, Dariganga plateau, Mongolia) eruption and kimberlite pipes (Victory-1, Shandun province, China). Detailed geological and gas-geochemical investigations shows diamondgenesis is the expression of the collision of the lithospheric mantle with meteor impact collaps explosion process. The essence of the phenomenon is mantle manifestation and plume of the combined nuclear-magmapalingenesis interaction. (дПТЦОБНЦББ д.в., фПМУФПЧ б.ч., 2001). (дПТЦОБНЦББ д., чПЙОЛПЧ д.н., 2003).